IoT applications generate loads of data stemming from the devices and the services they involve. Because data is issued in (near) real-time from a wide range of sources (e.g. wearable devices, home, vehicles, urban equipment, services, etc. ), it holds the promise of unlocking tremendous opportunities, such as improvements of products and services quality or the creation of new business models, thanks to an increased knowledge of the applications’ environment. However, without the ability to turn it into actionnable information, this huge amount of data is just “noise”. 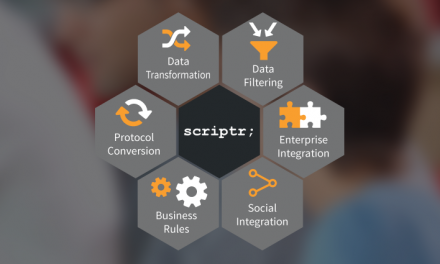 Therefore, IoT applications should first be able to process data, transform it and/or enrich it into meaningful data sets, which is something you can do using scriptr.io. As a second step, IoT applications should be able to rely on sound analytics infrastructure that will help turning data sets into actionable information, gaining granular insights into their environment. Keen.io is a comprehensive data analytics service for the Internet of Things. It provides valuable SDKs and REST APIs to store events on its premises, to define and run analytics and queries on data and display them through – embedded – charts, thanks to a library that can be used to build reports and dashboards. We thought scriptr.io’s developers would be interested in leveraging Keen.io’s set of features from within their scripts and thus, we wrapped Keen.io’s APIs into a connector. The latter can easily be deployed into your scriptr.io account from your workspace, by clicking on “New script” > “Import module” then selecting “Keen.io”. In the remainder of this document, we’ll implement a simple satisfaction survey application to illustrate how easy it is to leverage Keen.io’s features using the connector. Our scenario will be as follows: using a – very basic – web page, end users will rate the quality of the services of a given venue by pressing one of the “good”, “average” or “bad” icons on the page. These values, along with the corresponding venue, will be sent in real-time to Keen.io. We will then implement some simple reporting based on the ratings: (1) determine the number of good, average and bad ratings per venue, (2) determine what venue has the best rating and conversely (3) what venue has the worse evaluations. Don’t worry though it you do not yet meet the above requirements. You can still check the code below and try the app using the demo link. What we just did is to require (import) the keenio connector to our script and create an instance of the Keenio class, which is our main entry point to Keen.io’s APIs. First step of our sample application is to store the events that were generated by the survey into Keen.io. As we previously metioned, the data we need to store for every event are the rating and the venue. In addition, since Keen.io associates events to “collections”, we will have to specify what collection to use for the event. As you can see in the above code, to push an event to Keen.io, you just need to create a data structure with a “data” property holding the event’s data, and a “collection” property referring to the collection to which the event belongs. We then pass this structure to the recordEvent method of the keenio object. Let’s create the “addRating” script that will be invoked through HTTP requests to post new ratings. The script retrieves the rating and location parameters from the request and pass them to the “addRating” function of the “analytics” script. You can get the source code of this sample application from Github.